Heck horses were developed to resemble the now extinct Tarpan horses. They were created by the German zoologist brothers Heinz Heck and Lutz Heck, director of the Berlin Zoo, at the Tierpark Hellabrunn (Munich Zoo) in Germany. The first foal born from the program was a colt born on May 22, 1933 at the Tierpark Hellabrunn. The Heck brothers believed that they could recreate the extinct tarpan subspecies by back breeding living descendants. They felt that they could combine and rearrange the genetic material from these living descendants into a recreation of the extinct horse. They bred together several European small horse and pony breeds reputed to be descended from the tarpan. They used mares of the Konik, Icelandic Horse, and Gotland breeds. These mares were bred to stallions of a wild horse type known as Przewalski's Horse. The Hecks felt that the wild Przewalski blood would help to draw out the wild characteristics that they felt lay dormant in the domesticated pony breed mares. The first Heck horse, a stallion named Duke, was imported to the United States in 1954. He was imported to the Chicago Zoological Park in Illinois, followed by two mares in 1955. In 1962 a third mare was imported to the Fort Worth Zoological Park in Texas. All of these horses came from the Munich Zoo, and all Heck horses in the United States trace to these animals. There are now several private breeders in the United States, who use their horses for riding and light driving. In the early 1960's, the North American Tarpan Association was founded by Heck horse enthusiasts to promote the breed. Several breeders have crossed the Heck horse with other breeds to get a larger horse with some of the primitive characteristics. Breeds that are commonly crossed with the Heck horse are the Welsh pony and Arabian horse, and a new breed of pony, called the Canadian rustic pony, has been developed from these three breeds. 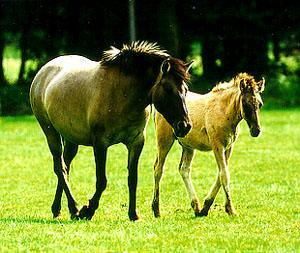 In Europe, many breeders cross Heck horses with Thoroughbreds to produce hunters.